I’ve been a little obsessed with ponchos lately. Not obsessed by wearing them, but adding them to my fall wardrobe. I have three new ones, all ranging from lightweight and casual, to heavier and dressy. If you’re curious about poncho outfit ideas, I hope these will give you some inspiration. This poncho from J. Jill was love at first touch. 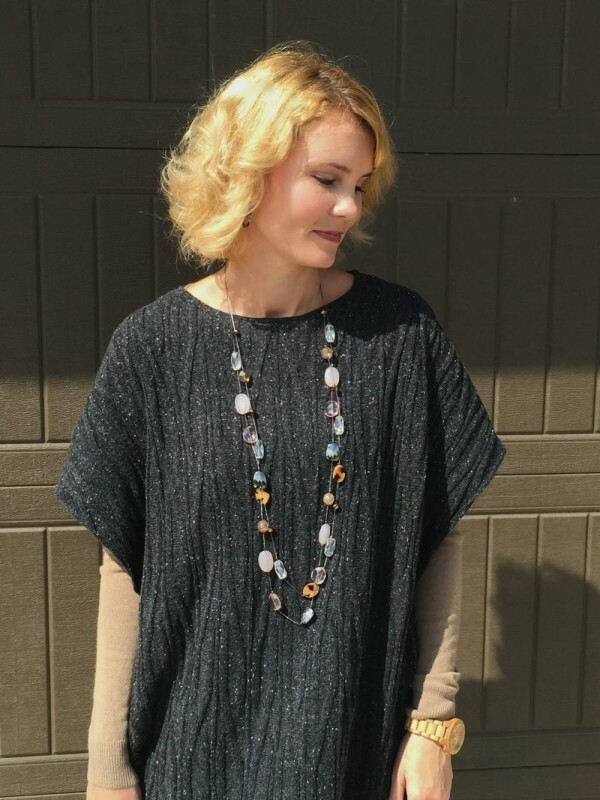 It is so soft and lightweight enough to start wearing in early fall. The shell side buttons add a beautiful touch to it and the boat neck style makes it extremely comfortable. I paired it with my J. Jill white denim, boots from last year’s Rack Room Shoes shopping trip and a new handbag that came in this month’s LeTote. I love wearing white both in the summer and the winter. Winter white is absolutely gorgeous and I really like the way it looks against the soft blue poncho. 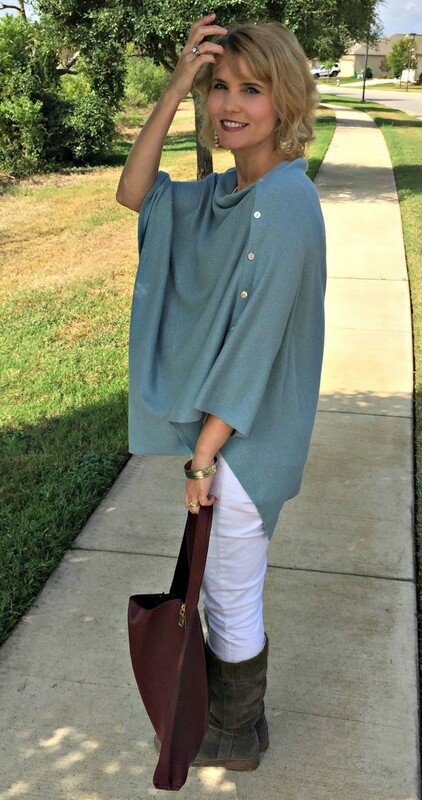 This Pure Jill Boat Neck Poncho looks so good with a pair of boyfriend jeans and wedges. 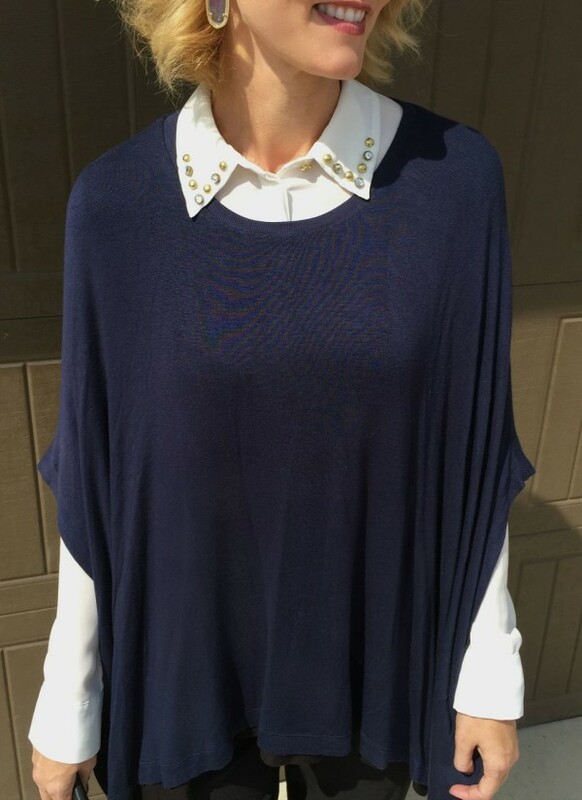 The dark blue color and texture makes it the perfect add-on item for fall and winter. 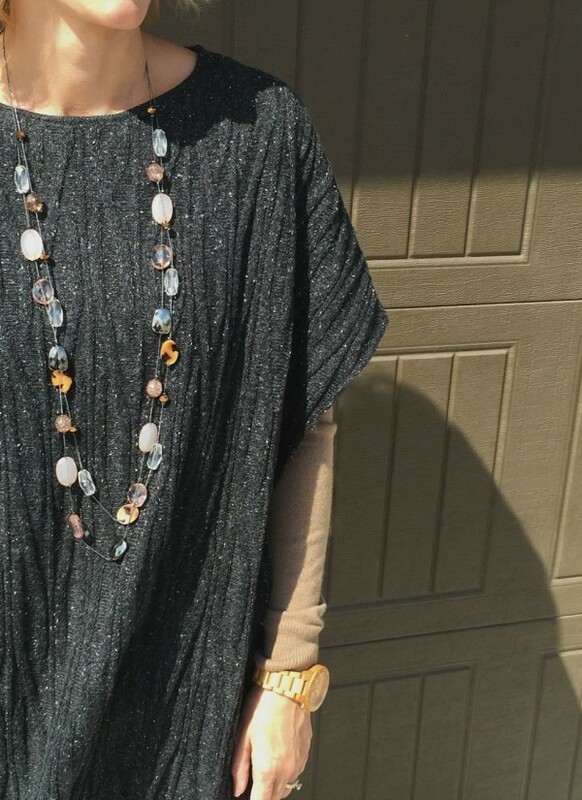 I really like how the partial side seems makes this poncho elbow length. 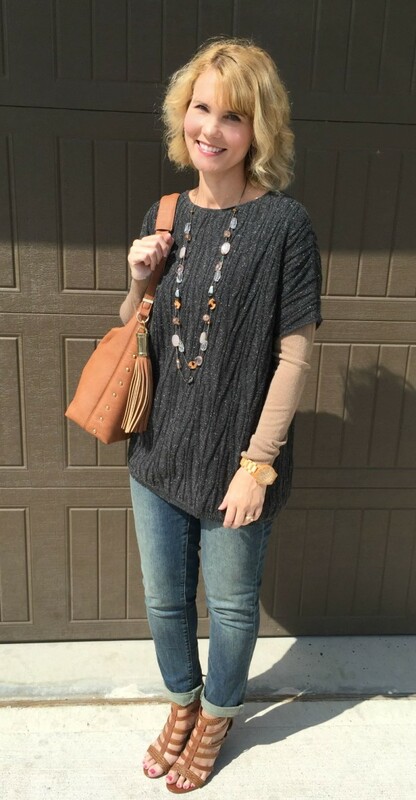 I styled the poncho with a long sleeve camel colored tunic that came in this month’s LeTote. I am really enjoying LeTote, but am considering switching to Stitch Fix just to see what it’s all about. Some of my fashion blogging friends love it so much! 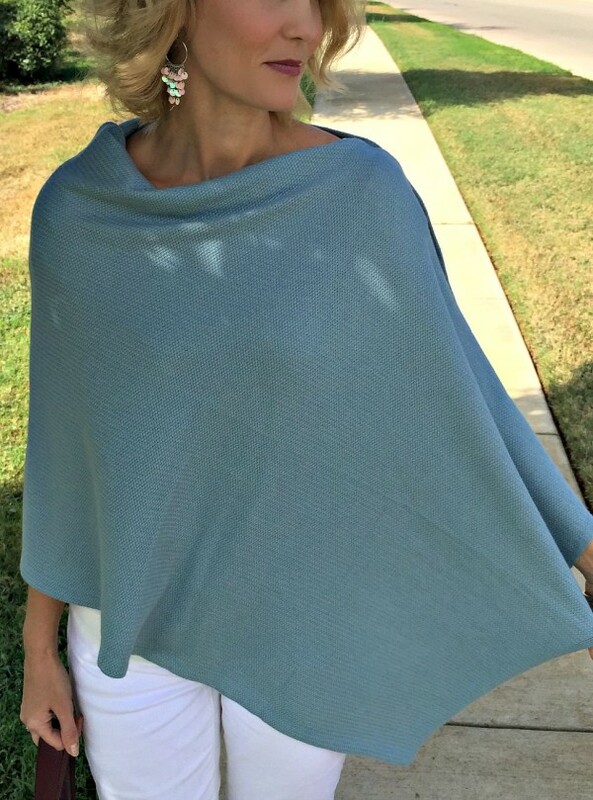 As soon as I opened my J. Jill package and saw this poncho, I knew I wanted to style it with my new boyfriend jeans from Max Jeans. I actually can’t seem to get enough of these jeans! I teamed up with two fashion bloggers last week and we each styled them. I got some great ideas from both of these ladies! 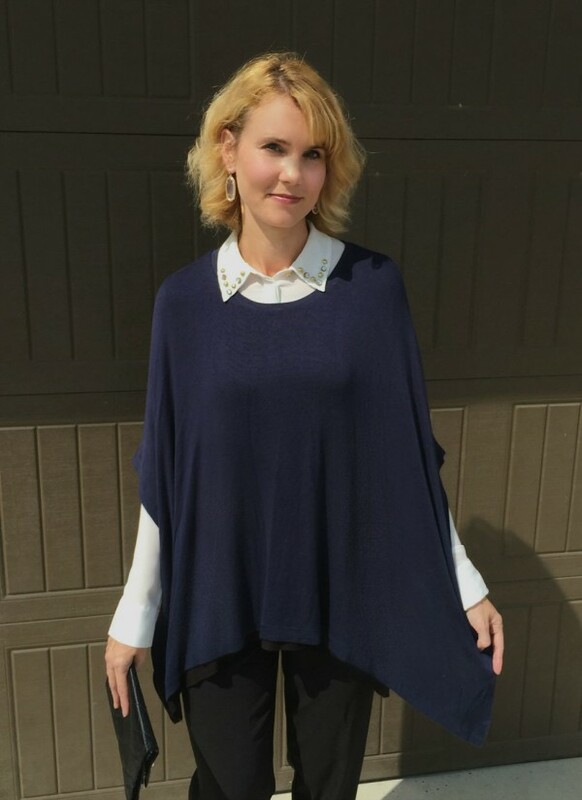 This beautiful color block poncho from Three Dots came in this month’s LeTote box. It comes in night iris/black or black/white and is the perfect throw on and go for the cooler season. Not to mention it is incredibly soft and comfortable to wear. 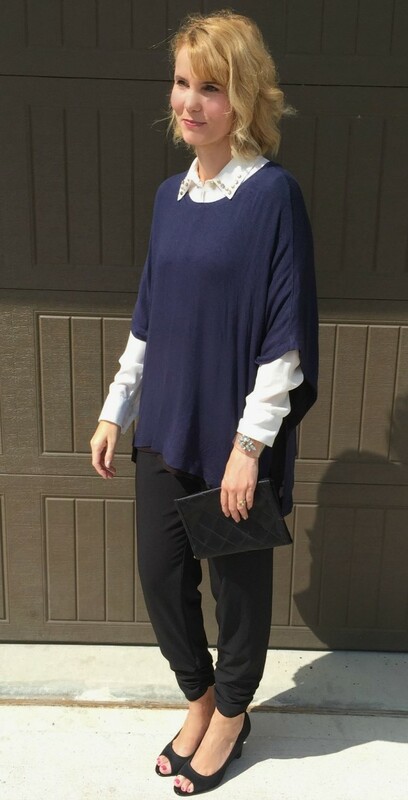 I knew I wanted to wear a dressier outfit with this poncho, so I styled it with my black pants from Target last season (similar here) and heels I borrowed from my daughter, plus a white long sleeve shirt from Forever 21 (similar here). What do you think about these poncho outfit ideas? Would you wear any of them? 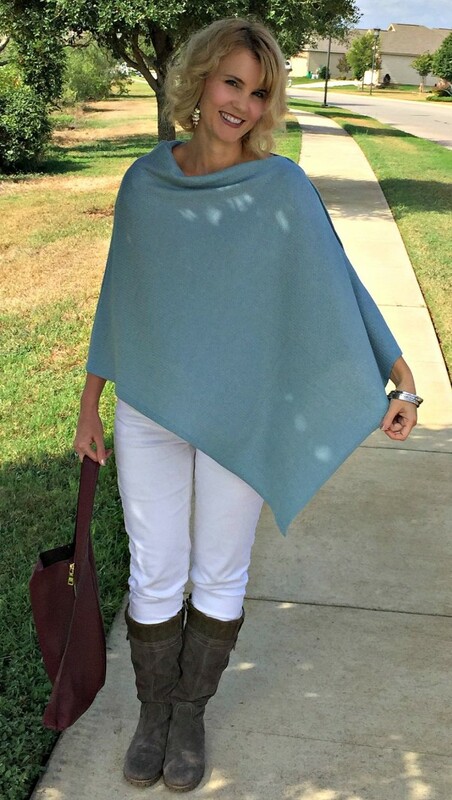 Do you wear a poncho in the fall and winter months? Let me know! Those are all super cute, but my favorite is the boatneck cable poncho love that!!! Super cute!I love them all. I LOVE this post… probably because I’m obssessed with a great poncho!!! I have teh boat neck one and I adore it, but that first one.. OH MY.. I need it. So gorgeous and that color looks fantastic.